This shrimp and bacon pasta recipe is fresh and full of flavor. The creamy tomato sauce is to die for, and this dish is ready in only 30 minutes! I love a creamy sauce with fresh tomato. My creamy tomato salmon pasta is quite similar, and that’s one of my favorites. You still get your creamy sauce, but the tomato brightens it a bit, and so it tastes much less heavy. I guess you’d call it a rosé sauce (not to be confused with the wine!). This shrimp pasta with tomato is very fast and straightforward. It’s one of those pasta dishes that work if you want something a bit different and more elevated on a busy weeknight, but it’s also good enough for when you’ve got company. Those are my favorite types of dishes to create! I don’t go overboard with the bacon here. It’s just enough to let you know it’s there, but not enough for it to be too much. I’d say we’ve got a really nice balance of flavors in this pasta. Pro tip: Feel free to take the tails off the shrimp prior to cooking them. I usually do when I am not staging photos. I’ve heard that it’s a pet peeve of some people when they see shrimp tails in finished dishes. Love easy shrimp recipes? Try my shrimp and mushroom pasta or my shrimp pasta with a rosé sauce. 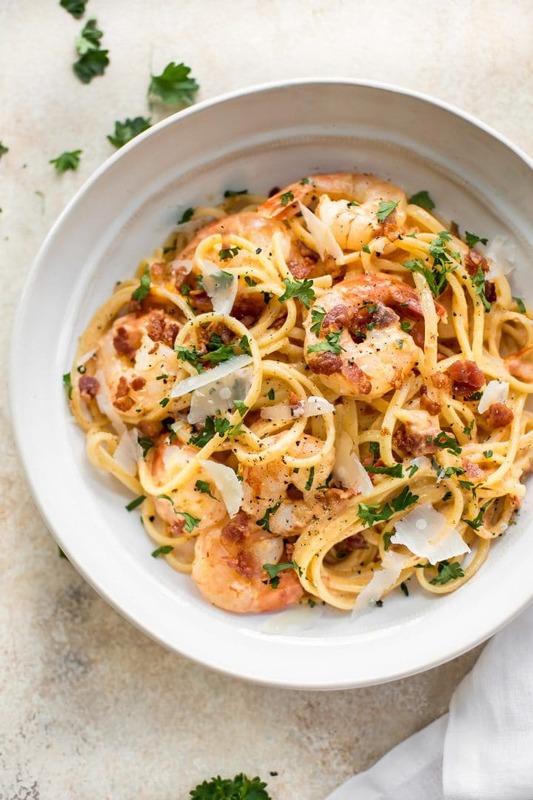 Will you give this shrimp and bacon pasta recipe a go? Boil a large, salted pot of water for the pasta. Cook al dente according to package directions. Prep your bacon (I use kitchen shears to make it easy to cut it up). Fry the bacon over medium-high heat in a skillet until crispy (7-10 mins.). Take the bacon out of the pan and set aside. Drain most of the bacon fat from the pan, but keep a little bit in for flavor. Add the tomato, garlic, Dijon mustard, Italian seasoning, and chicken broth to the pan. Give it a good stir and let it simmer for about 1-2 minutes. Add the cream to the pan. Let it cook for 5 minutes (so it reduces & thickens). If it's bubbling like crazy, turn down the heat. Add the shrimp and bacon to the pan. Let it cook for another 4-5 minutes or until the shrimp have cooked through. Drain the pasta and add it to the pan, tossing until it's nicely coated in the sauce. Stir in the parmesan cheese and season with salt & pepper as needed. Garnish with parsley if using. I used large shrimp (41-50/lb. size) in this recipe. Smaller shrimp will work too. Such a lovely meal Natasha. I love that it is the perfect quick weeknight meal but could also do double duty as an elegant meal for a dinner party. As for the tails. . .well. . .they are always left on at restaurants likely for the same reason. Welcome to my blog, Cindy. I am VERY happy for you to stick around! 🙂 Karen is great… I just saw she wrote about the Lizard People thing. Too funny. Just made this for dinner….easy and delicious! I licked the plate much to my husband’s dismay! Hi Lauren! You could try half-and-half (plenty of readers have subbed it in various recipes of mine and it seemed to work), but honestly it’s just not the same without the fat content in the cream consistency-wise. And if it’s a particularly lemony sauce, the half-and-half (or if you use milk) can break and curdle from the citrus unfortunately. Hi! I just made this dish. Lovely foundation, however, for those who would like a lighter, less mustard-y sauce …these are the changes I made and it turned out delicious! note: I made the original recipe and tasted the sauce before adding the shrimp, bacon, and noodles. I was very glad I did because whew! it was rich and had a strong mustard flavor. I saved about half of the original sauce, and added to the pan 1/4 c. sour cream, 1/2-3/4 c. whole milk, 1/2 Tbsp. poppy seeds, and some extra chopped veggies, namely mushrooms and asparagus. Nice meal in one dish! Thank you, Natasha, for a beautiful beginning to a dish I can call my own! I will definitely search through your recipes and see what else I can find that is more closely suited to my own specific tastes. Blessing in 2019! Hi Natasha. I haven’t made this yet. In hoping to this week . Can I make it all up and leave it warning in the oven? Thank you in advance. Hi Anne! Hmm… I’m a little concerned that the cream sauce may go a little weird. It can separate and just not taste as good. Made this fabulous dish! And we don’t care for Dijon but I have a thing you make as is first time and glad I did, was not over bearing. Thank you for a winner! !